What Is Shimon Peres’s Legacy? Home / Israel / What Is Shimon Peres’s Legacy? Shimon Peres at the World Economic Forum in 2007. Credit: Wikimedia Commons. Following Shimon Peres’s death at 93, delegations from 75 countries traveled to Jerusalem to pay their respects. Peres was a part of Israel since its founding—and as his country grew, his priorities shifted. At first, he was the man who helped build and strengthen Israel’s military. But in his later years, he was the man who worked to establish peace, who helped orchestrate the Oslo Accords, who won a Nobel Peace Prize. Moment speaks with Reuven Hazan, a professor in the Hebrew University of Jerusalem’s political science department, about Peres’s life. 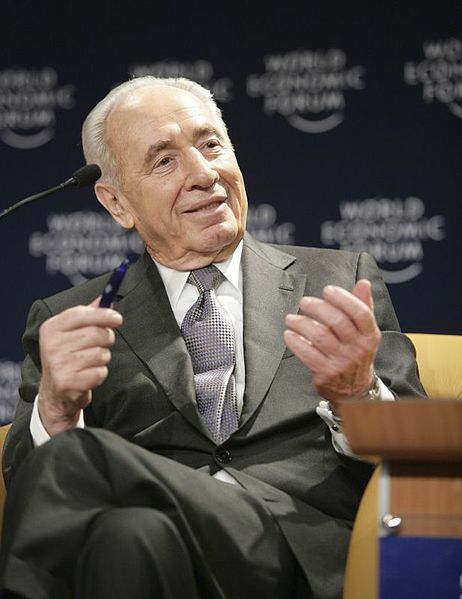 Shimon Peres has been described as one of the last links to Israel’s founding generation. How does this shape his legacy? That’s quite superficial because it’s simply a matter of age. The people who were around and old enough to already have an impact in the 1940s were born in the 1920s. We simply don’t have too many people of that generation. So his passing at 93 sent us a message that he is the last and that all the people who we teach about in the history books are gone. On the other hand, the fact that he was still here and that he was present through every major event that this country has gone through—and through the process of establishing this country—reminds you just how young the country is. That one human being could have helped make this country a reality and then helped build it and help shape it. And that person, up until a week ago, was still with us. Very few countries are young enough to remember that. What was Peres’s relationship with Benjamin Netanyahu like? His relationship with Netanyahu is extremely interesting. It began in 1976 when Israel sent some planes into Uganda, into Entebbe, to rescue an airplane full of passengers that had been kidnapped. Netanyahu’s brother was one of the commanders of that mission and was the only Israeli soldier to be killed. Shimon Peres was the minister of defense. He ordered the mission, and immediately after he developed quite a close relationship with the entire Netanyahu family based largely on his showing how much he cared for Netanyahu’s brother who had fallen. They were close behind the scenes for years. Politically, they went at each other. In 1996, when they were both running for prime minister, they ripped each other apart. But behind the scenes they were close. One of the things that some people in Jerusalem know—but most people in Israel don’t—is that the prime minister’s residence and the president’s residence are about a five, six minute walk from each other. After 2011, when Sonya Peres died, there were multiple Friday evenings when Peres would either walk to Netanyahu’s home and sit with his family or Netanyahu would walk over to Peres and spend Erev Shabbat with him. This was never part of the news that reached the media. What was Peres’s political legacy, and his impact on the Labor party? When it comes to politics, we have to distinguish between two different Shimon Peres’s. There’s Shimon Peres the politician, and on that front he was not very successful. For example, the Labor party won every election up until 1977, which was the first time he led the party. So the first time he led the party, they lost. The second time he led the party, they lost. The third and the fourth time he led the party, they lost. In other words, the party wins every election for 30 years, then Shimon Peres takes over for 15 and loses every election. And in 1992, when the party kicked him out and brought in Yitzhak Rabin, they won again. And in 1996, after Rabin was assassinated, and Peres was back at the helm, they lost again. So politically he didn’t do the Labor party any good. He was not an astute politician. From an internal Israeli perspective, he not only was not liked, but he was connected with some of the biggest political fiascos in Israeli history. The only time Shimon Peres became popular in Israel is when he stopped being a politician, and that’s when he was elected to be president. The president of Israel, unlike in the United States, is a job above politics. It’s closer to what would be the queen of England than the president of the United States: someone who doesn’t get involved in politics, someone who is above politics, someone who represents the entire nation, someone who accepts foreign dignitaries, movie stars, rock stars, opens up cultural events and so forth. In that role he truly became accepted and loved by the people. President Barack Obama called Peres “the essence of Israel itself.” Do you agree? I think it was a little over the top. But then again, when you have the funeral of someone who garners such tremendous support from countries all over the world, it’s acceptable to embellish. Shimon Peres helped build Israel. He was politically a divisive and not very successful leader. When he moved toward peace with the Palestinians, it divided Israel. It created lots of domestic conflict. The only time he became Israel is when he became president. In other words, when he ceased to do anything, then he stopped being controversial. But then again, everyone came to Jerusalem to praise him, not for ceasing to do anything, but for always having had the dream and the vision to do something. There’s an awe that most Israelis saw in the arrival of two presidents of the United States, three prime ministers from Canada, two presidents from France, kings, princes. It showed us that if Peres’s vision could be implemented—and that doesn’t just depend on us; it depends 50 percent on our partners—then this country could be an amazing place. But again, that doesn’t mean we can take a leap of faith if all that means is to fall off the precipice. Any agreement we sign is an agreement that we must be able to defend when things go wrong, because in this part of the world, things will always go wrong. What will be Peres’s enduring legacy? That depends; it depends on where we go with the peace process. If we are successful at negotiating, then he will be remembered as the person who set us on the path. But if you look at the Middle East today—if you look at what is going on in Syria, if you look at what is going on in Iraq, if you realize how precarious the regimes in Jordan and Egypt are—you realize that today, there really isn’t anyone to negotiate with and make a historic agreement. If Israel is perceived as more hawkish today and Netanyahu wins more elections, it’s not necessarily because Israelis are hawkish. It’s because the entire region has deteriorated and we prefer to err on the side of caution. When it comes to Israel’s borders, we cannot afford to make mistakes. So we can have vision and we can be men of peace and we can be everything that Obama said about Peres, but we also will have to pay for it with our blood, our children’s lives, who are in the Israeli army, if we make a critical mistake. And right now the region is not sending any message to Israel that we should take a leap of faith. Peres won the Nobel Peace Prize in 1994. Could you describe his work as a peacemaker? It’s very interesting because he’s associated at the beginning with building up Israel’s military, not only as the director general of the Ministry of Defense, but as the guy who helped create Israel’s nuclear program, the man who helped build the Israeli army. But once Israel’s army was strong enough, once Israel’s army could guarantee the safety of the state, he understood that the only way to truly be safe is not to keep fighting wars, but to think of how we could stop fighting wars. In that role, in the early 1990s, he shifted very much into the pro-peace camp, the give-up-all-the-territories camp. He’s a military man, he’s a man that understands that control of territories is important, that geographically Israel is extremely small and needs a better perimeter to defend itself. But once all that was established, he realized the only way to truly make Israel secure was to come to terms with our neighbors—and allow our neighbors to come to terms with us. Name an Israeli leader who caused more fatalities to innocent Israelis than Shimon Peres. What a silly, ignorant remark. Golda Meir (Yom Kippur War), Ariel Sharon (First Lebanon War), to name a few. And that’s giving more credit than is due to your puerile misuse of “cause”. None of these deliberately caused any such fatalities. And in this war-stricken context — which will claim fatalities whichever way we go — Peres did more to minimize these than any other Israeli leader. Enough that he oversaw the extraction of Israeli forces from the mire of Lebanon in the ’80s; and that the security collaboration between Israel and the Palestinian Authority — one fortunate remnant of Oslo — today regularly prevents much worse terror than otherwise.